In 1897, James W. and William A. Wadsworth were by then ex-presidents of the New York State Agricultural Society, as noted at the top of that organization's letterhead—which was celebrating its annual showcase of farming at the State Fair in Syracuse. 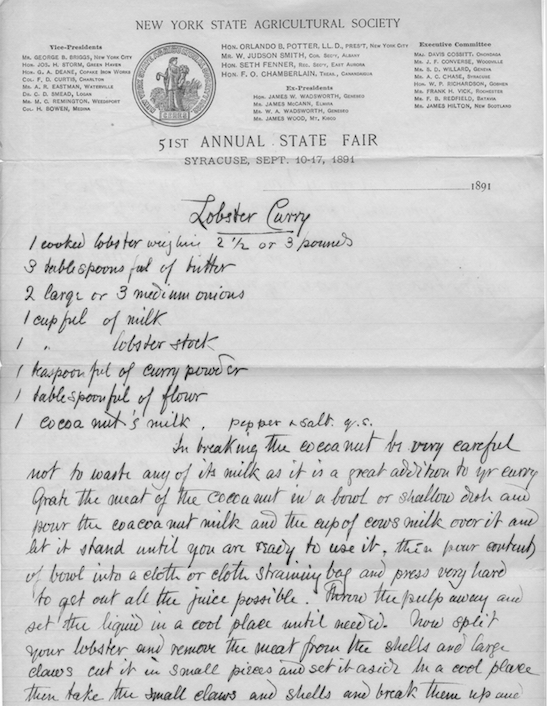 The Wadsworths’ prominent role in upstate agriculture is less surprising than what was written upon the document: a recipe for Lobster Curry. Whereas today it is more common to think of food tourism as entailing visits to farm dinners or Brooklyn restaurants, the recipe brings to mind a different concept of traveling ingredients as they are experienced upon the plate. Lobster hadn’t always been such a delicacy; at one point it was served in prisons due to its low price and availability in the northeastern United States. Luxury dishes, according to Marijke van der Veen, “are not specific items of food, but rather those foods that in any particular place and time are regarded as an indulgence and a status indicator.” Lobster curry certainly can be viewed in this light, but moreover as a complex type of food experience. The Wadsworths did not travel as agricultural tourists, as city dwellers do today; rather, it appears that they took the approach of adventurous eating in order to sample cuisine from around the world. Meanwhile, they continued to access many foods that were produced in the Genesee Valley. 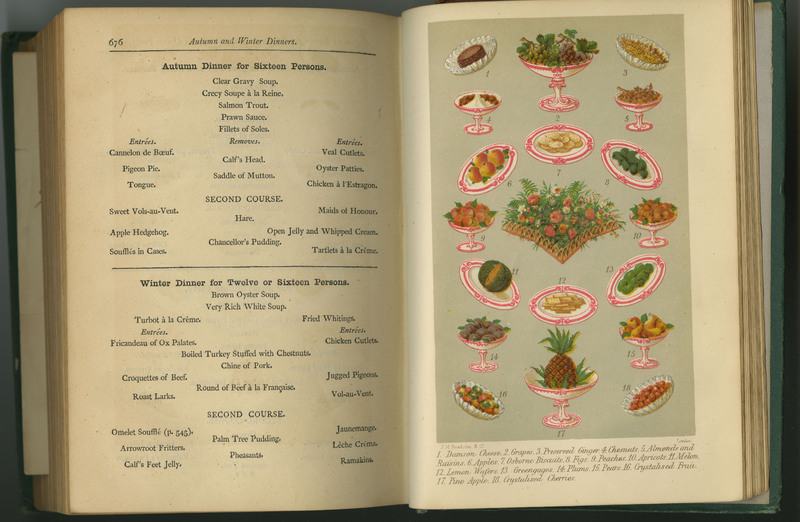 Among their personal collections is a culinary guidebook,The Table, that was published in 1889 by famed Delmonico’s chef Alessandro Filippini. His cookbook offers menus for each day of the year, charts of seasonality, countless recipes, and menus from famous banquets. Thinking about Filippini’s more unusual recipes juxtaposed against daily menus and seasonality charts helps us visualize the tension between exotic and local eating, along with the subtle experience of food tourism. In fact, given how America’s industrial system currently produces processed foods that seem to arrive from no particular place at all, it becomes possible to conceive of local and organic foods as our equivalents to exotic dishes like lobster curry at the turn of the 19th century—a distance that is measured in miles but also social class. To be mobile, whether in our travels or tastes, is to possess power; to eat nonindustrial food, at home or in restaurants, likewise is to possess power. Let’s conclude by considering another image from The Table, one whose design suggests a kind of culinary heraldry. The colored lithograph depicts exotic ingredients and prepared dishes, all of them on fancy plates; it reminds us that food and social class never will be separate. With that limitation in mind, we can attempt to negotiate our roles as locavore and food tourist in ways that celebrate cultural diversity. The movement of immigrants, cuisines, ingredients, and recipes accelerated throughout the 19th century; diners at the Wadsworth estates were among the earliest food tourists in the Genesee Valley region but not the last. —Filippini, Alessandro. The Table. New York: Charles L. Webster, 1889.